Here she is, Miss America 2.0. 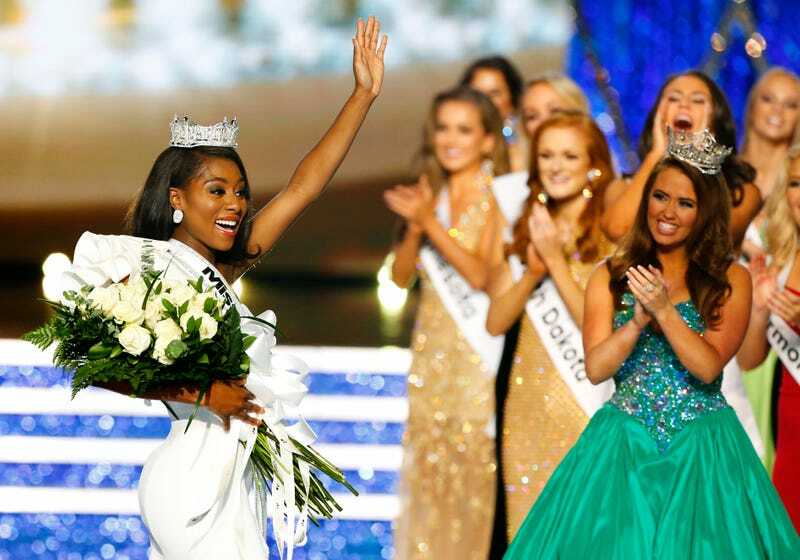 On Sunday night, Miss New York, Nia Imani Franklin, became the first woman to wear the crown of Miss America after the competition underwent some much-needed (and much-publicized) changes, including cutting its controversial swimsuit competition. The 25-year-old classically trained opera singer represented New York, though she’s a North Carolina native. Coincidentally, the first black Miss America, Vanessa Williams, who won the crown in 1983, also represented New York. This year also marked the first time Miss America contestants were required to have social impact statements, according to the New York Times. These statements focused on causes they would advocate for. For many contestants, these platforms revolved around social justice issues. Miss Michigan Emily Sioma, for example, called out the state’s issues with clean water. Introducing her state, Sioma noted Michigan has “84 percent of the country’s fresh water but with none for its residents to drink,” reports the Times. Franklin’s focus was on equal access to education—specifically focusing on the social impact arts education can have. “There is a 20 percent higher graduation rate at schools where music is a part of the curriculum,” Franklin pointed out during the competition. After her win on Sunday, Franklin addressed earning the title without the swimsuit portion of the competition—which had been much criticized (and rightly so) for being an archaic and misogynistic evaluation of a woman’s worth, especially for a scholarship pageant (the winner of Miss America is awarded a $50,000 scholarship). “All these women onstage are more than just that,” she added.